Here’s a review of Cipher Auto and their racing seats. I found the company on the forum honda-tech.com. I browsed through the many seat vendors in the Sponsor Market place and came across the Cipher Auto thread. I was in need of new seats for the integra and I couldn’t bring myself to purchasing 1200/per seat brand name ones so I decided to look for a replica/knock off/ start up company/brand and give them a try. Of all the cheaper seats out there Cipher Autos seemed to be the best looking non logo’ed. I considered knock off brand brides but I’m not trying to fool anyone and these seats would be going into my daily driver anyway. Most folks on the car forums raise the issue about the safety of these replica type seats. I don’t plan on racing so it wasn’t too much of a concern for me. I really like the Bride Digo style of seat so I private messaged them on honda-tech and asked for a quote on Cipher Auto’s CPA1019 Black Cloth w/ Suede Insert & Red Outer Stitching racing seats, seat brackets, and their Cipher Racing Black 4-Point Racing Harness Set. I also asked if they offered a military discount (which they do) and the quote was under $500! I thought that was an amazing deal for seats, brackets and harnesses so I decided to take the risk and try Cipher Auto out. I placed the order and made payment on friday, July 8th and received the seats the following friday on the 15th. I immediately unboxed and inspected the seats before assembly. The seats were all packaged in one large box with the seat bases separated from the backs. I did find that on one of the seat bases there was a couple tears. Didn’t look like it happened during shipping because the seat pieces came bagged in plastic and I didn’t find any tears before removing the plastic for each piece. I immediately called Cipher Auto to find out how to get a replacement seat base. Customer service informed me to email them a photo of the damage and that they may be able to get a replacement sent out the same day. 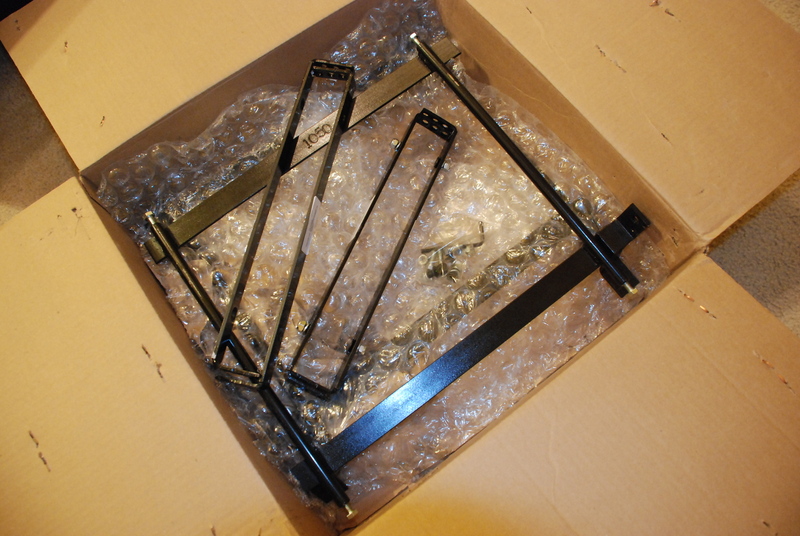 Other than that issue They appear to be great quality and they assemble pretty easy. I was informed that the seats would arrive before the brackets so I’m still waiting on those. Also, the day they shipped my order, monday, the 11th of July a rep from Cipher called in regard to the harnesses I ordered. They were out of stock on the black ones so they wanted to see if I wanted the cam lock version in black or possibly the seat belt style in red. I opted to go with the seat belt style red harnesses. Since the teg is going to be my daily driver I didn’t want to fiddle with a 4 point cam lock every time I jumped in my car. Here’s a couple photos of the box when it arrived. Here’s a photo right after unboxing. Decently packaged. Everything came bagged in plastic sealed with tape. Seat bottom. Everything seems to be good quality. Really like the suede middle inserts! The fit and finish are very nice. Tears in the seat base. Cipher Auto is currently working on getting me a replacement. When a rep called on the 11th to confirm my order he asked whether I would like adjustable or non and he explained the differences between the two. The non adjustable would be like stock seat height and the adjustable at its lowest setting would be a little higher than stock height. I like the height of integra seats OEM. I emailed them back regarding this. Waiting on reply. 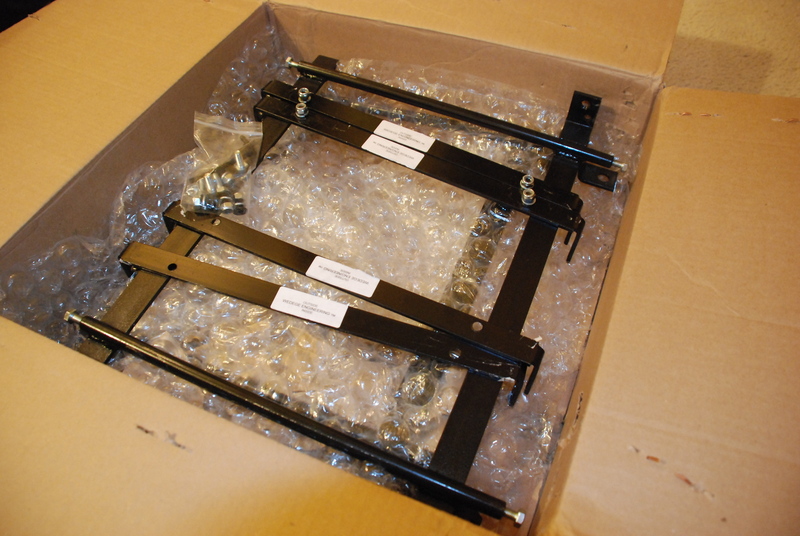 July 20th, 2011 update: Cipher emailed saying the replacement seat base is on its way. July 23rd, 2011 update: Received the replacement seat base. And have the two seats assembled. Now just waiting on the correct, non adjustable seat brackets. Yes we got it back and passed it to the return dept to verify, and after that process done then we will have the welder to make another set for you. We will update you as soon as we got it done. In the meantime we do not have ETA yet. 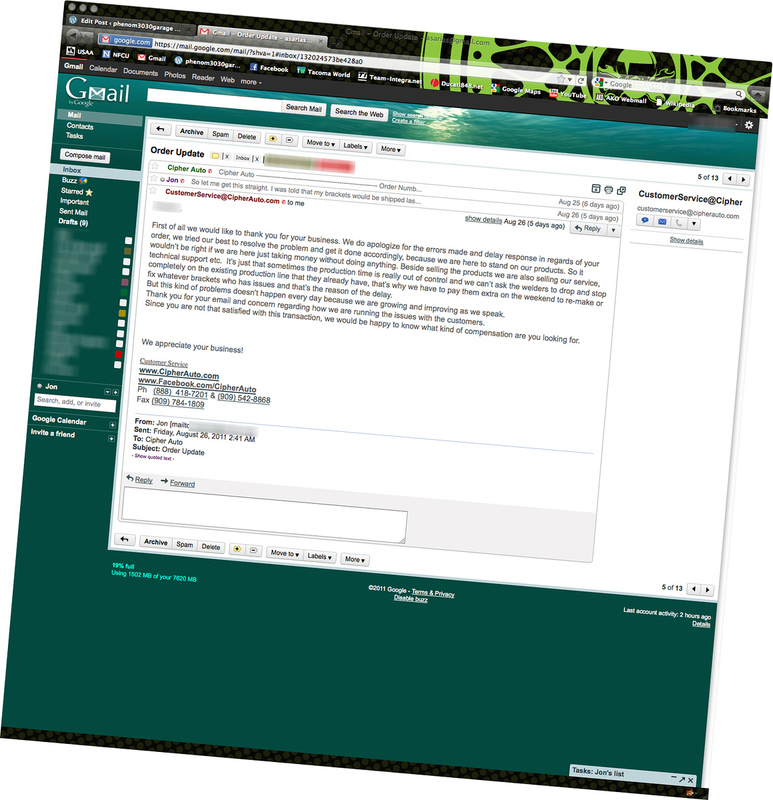 August 14th, 2011: Sent Cipher Auto an email on August 8th and have not received a reply, so another one was sent today asking when could I expect the brackets. Last email I received from their customer service department was on August 1st. Its been over a month since I initially paid and placed my order. Seats seem to be great, customer service is highly lacking. Since you are not that satisfied with this transaction, we would be happy to know what kind of compensation are you looking for. 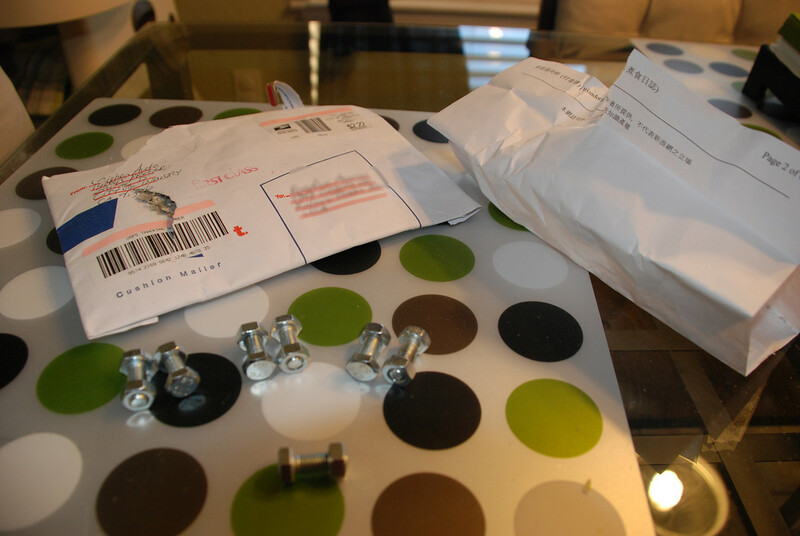 August 30th, 2011: I finally received the non adjustable brackets from Wedge Engineering (Cipher outsources to them I assume). Only issue now is that there is no hardware. 😐 I sent them an email regarding this new issue. Let’s see how this problem is fixed. And in regard to their last email about compensation. I believe refunding the $189 for the brackets is fair. Nearly two months later I still do not have a complete order. I promptly made payment. Why couldn’t I receive my order in a timely manner? PLEASE CLICK ON THE IMAGES TO SEE LARGER PHOTOS. September 7th, 2011: So John Tang from Cipher apologizes for Ed’s lack of customer service and offers the excuse that Ed is under a lot of stress. He informs me that he will send out the hardware which I received today. And what do I get to my surprise? 7 nuts and bolts…7. Not the 8 that are needed, 4 per seat to attach them to the brackets. At this point I’m completely done with my dealings with Cipher Auto. I appreciate John’s efforts but it was too little too late, and just not enough. I strongly suggest not buying from Cipher. One day short of two months I receive as complete an order as I’m willing to deal with. At first the customer service was okay. Issues were noted and resolved, over the span of weeks mind you. But an experience with a rep named Ed shot their reputation to crap. Now let’s see if the seats hold up. They seem to be of decent quality. I’m happy with the fit and finish so far. I’ll update as time goes on and show how the seats hold up. DO NOT BUY FROM CIPHER AUTO. THE WAIT TIME IS HORRIBLE AND THE CUSTOMER SERVICE IS WORSE. Next post: Throw back photos of the 848.